» Water Avenue: A street solution? From Montgomery Street eastward, sections of Water Avenue sport a fresh surface. The poor shape of many old residential streets is a common subject of complaints. The city administration says there’s never enough gas tax or other revenue to do much about it, and Mayor Sharon Konopa’s proposal for a 5-cent local gas tax has been put aside for now. House Bill 2017, the legislature’s package of higher taxes and fees to pay for transportation improvements, is supposed to boost the funds going to cities, but how that works out remains to be seen. Parts of Water Avenue were never improved as a regular city street with asphalt paving and curbs and gutters. It was essentially a gravel road. Some years ago, the city applied an oil mat and then a “chip seal” treatment to the unimproved parts, and this worked out OK for quite a while. But recently potholes started growing, especially outside the gate where trucks turn in and out of the Parr Lumber yard. “The surface had started to deteriorate, so we contracted to chip seal it again this year,” Chris Bailey told me. She’s the public works director for operations. I could not learn how much this treatment cost for the section of Water where it was applied, from Montgomery Street east nearly to the railroad trestle. The person at City Hall who likely has the information is on vacation, and nobody else seems to know. In the past week, I’ve noticed numerous places of small sectional sealing to entire “Places” off off “Streets”. Hot Diggity..people employed, improvements to the commons and TAX $$$ spent HERE! ….now this is LIVING, my friends. 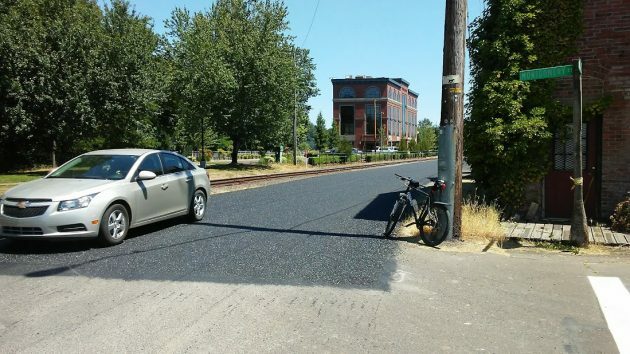 Chip Seals costs much less than asphalt ($2.50 per square yard for Chip Seal, compared with around $12.50 per square yard of ½ inch thick asphalt). Chip Seals work best to preserve pavement that is in good condition. This is why the base of each street is repaired and paved with asphalt before the Chip Seal is applied. The state of older residential roads in the city is shameful. Don’t remember a time it was worse. No project dollars to shift? No needs re-prioritizing? The City Council seems to be staring at an empty cookie jar and not much else. What we need to do is make our road problems more inclusive of reality, acknowledging the diversity of problems to treat, there by establishing harmonious relations with all city drivers. Chip seal can fill in small cracks etc. and greatly extend the life of streets. In Winter, water can get in the cracks & freeze, causing the cracks to enlarge at an accelerated rate. Apparently the City would rather spend their money for downtown parking for the merry go round. It just means the rest of us are going to have to pay “BIG TIME” in the future when our residential streets need a premature REBUILD.